The cleaning of the stay is paid at the end of it of a value of 35 euros that is paid in hand. The I. G.I. C. by the owner. Difficult finding it. Go down hill. Past 2 sets of white writing on red wall. After 2nd set white stone on right. Drive to villa immediately on right after (before caged car park on corner. Lovely villa and fabulous views. Fantastic secluded balcony which gets sun 14.00 onwards. Barbara was charming. The bed was comfy. Two sofas to lounge on. A lovely terrace with sun beds. All good. The apartment is comfortable and well equipped . We endorse other reviews that a car essential and be prepared to climb lots of stairs. It wasn’t easy to locate except we had researched google earth and maps.me apps beforehand. There is no restaurant in easy walkable distance. Be prepared to cook something on a late evening arrival or eat before arriving. There is a general supply of non perishables in the kitchen which can be used and replaced. It was just warm enough in January, there is a heater and extra blankets. We would recommend it to our likeminded friends. You know the reward you get for hiking a mountain? You get that just by waking up! Well stocked, comfortable, peaceful, helpful, friendly, directions were not accurate, but it was well worth the extra time trying to find it! 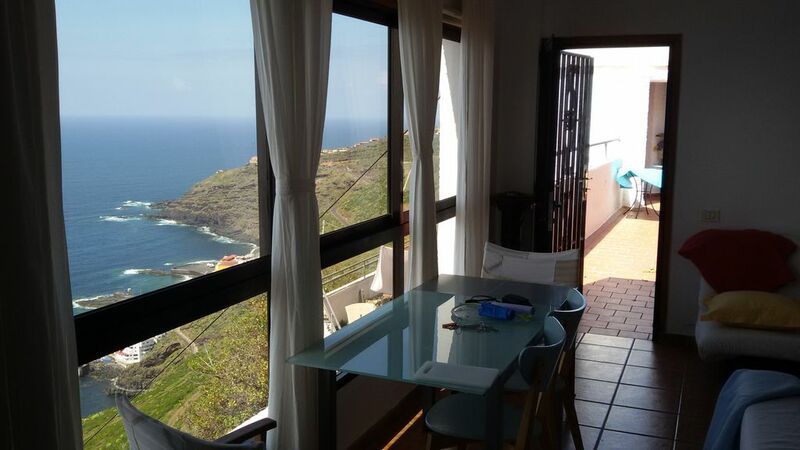 We had a really good stay in Barbara's apartment which has lots of space and fabulous views. It was very quiet - just the sound of the waves which we loved! The apartment was very comfortable so staying here was easy. The kitchen had most appliances but a proper toaster would have been welcome, (is this just an English thing?!). One point for future visitors to Mesa del Mar, Taroconte. Look for No.58 Las Vistas. We knew the number but drove right down to the coast as we didn't realise Las Vistas was the right place! Knowing this would have saved us a lot of time and stress, especially in the dark!! We would certainly stay at Barbara's place again should we return to this location in the future. Many thanks, Amanda and Stu. We really enjoyed the views from the apartment, the apartment has good rooms, comfortable bed, in a good location to go site seeing and an opportunity to sample some of the local food and eateries. However, we would say that it is perhaps not an apartment designed for January as it was very cold at night and the weather was very mixed, mostly rain and cloud. We have since learned that this is fairly normal for this time of the year. The facilities within the apartment are fairly good, though we missed having a microwave which is always handy after a day out. The wifi is fairly good and we were grateful for it on the cold wet nights as we could watch the likes of Netflix on our laptop. The owner Barbara provided us with a heater for the cold evenings and we gave her some extra money to cover the cost. Barbara is a good and helpful host. Be prepared for a bit of a hike up the stairs to the apartment, good cardio vascular. However, the climb is worth it for the wonderful views and we intend if possible to return when the weather is guaranteed to be much better. gracias chicos por su comentario . este año en canaria ha sido un poco mas frío que lo normal . estoy preparando para el próximo año una calefacción mas adecuada. han sido unos huéspedes comprensivo y amable espero repitan un saludo muy agradecido barbara .